Modern house design features an open and flexible floor space and extensive use of modern or industrial mixed materials in building a home. Actually, these houses are common fixtures of suburban neighborhood across the country. Likewise, modern homes emphasize open layouts to offer more functionality. 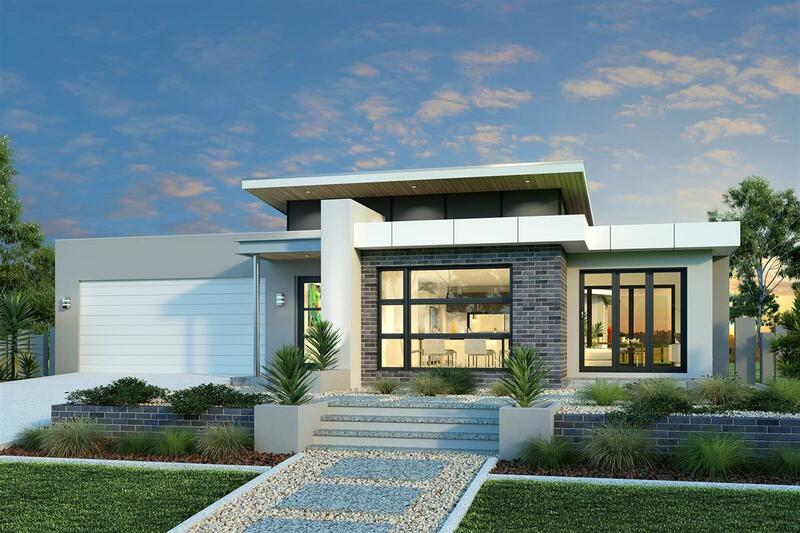 Additionally, modern house plans are perfect for those who want to embrace wholesome contemporary style. The house in feature stands in a lot that measures 13.0 meters wide and 20.25 meters long with a building space of 263.25 sq. meters. From this area, the usable space covers 212.00 sq. meters including the carport. The plan is designed to maximize the living space which also aims to demonstrate the proper balance between the open living spaces and private rooms. 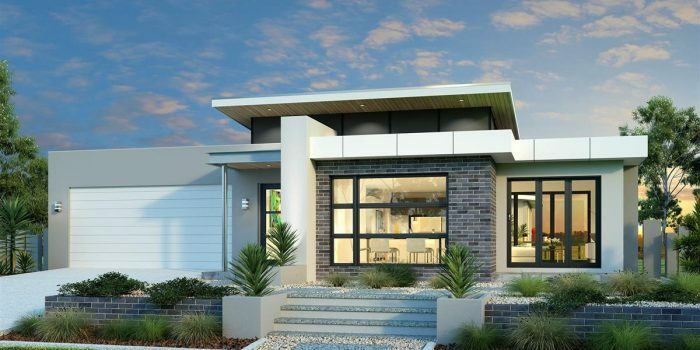 This modern house design features the inviting open family living zone in front, while the nighttime zone settles at the rear portion of the house. The living space also includes a designer island kitchen with a walk-in pantry and covered alfresco. On the other hand, the sleeping zone designed for peace and privacy has three bedrooms. Meanwhile, the middle section of the house composes the activity and recreation rooms for the whole family. A splendid design for a family of 5-6 members, the house features the following elements, porch, patio, foyer, living room, dining hall, media center, activity room, three bedrooms, kitchen and pantry, two full baths, laundry, alfresco and carport. The rooms and spaces create a wonderful arrangement in a rectangular lot. Wall-sized windows offer insight into this beautiful home and accent the brilliant design. 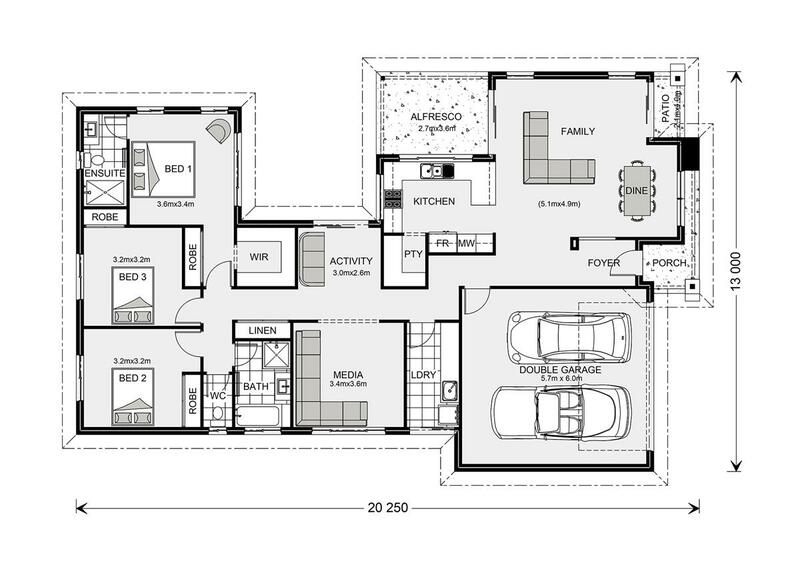 This plan features a friendly layout of the living spaces, while the night zone defines a high level of privacy. Quaint and cozy on the outside with porch and patio, this three bedroom modern house design surprises with great living spaces. In fact, the plan hosts a flexible and relaxed living room ventilated by plenty of air from the alfresco. The living spaces are also kept comfortable by wall sized window facades, extending the comfort to the dining room and kitchen. The island kitchen with a benched snack bar for quick and easy meal services flows freely to the living and dining rooms. A wonderful butler’s pantry standing nearby is also provided for support activities. Meanwhile, the central part of the house features the activity room and media center to offer recreation as well as entertainment to the entire family and guests. The sleeping zone occupies the rear section of this modern house, away from everyday activities and includes a master suite and two secondary bedrooms. A private master’s suite tucked away for peace and privacy, includes a lavish ensuite bath and a walk-in-closet. The secondary bedrooms stay side by side on the left of the master’s suite. They are accessorized with individual walk-in-robes, while sharing a common bath situated besides one of the bedrooms. A two-car garage with remote sectional door occupies the comfortable left corner of the house. Living in this modern house design with a fusion of comfort, coziness and privacy is what most families would like to experience.